I am going to be perfectly honest. 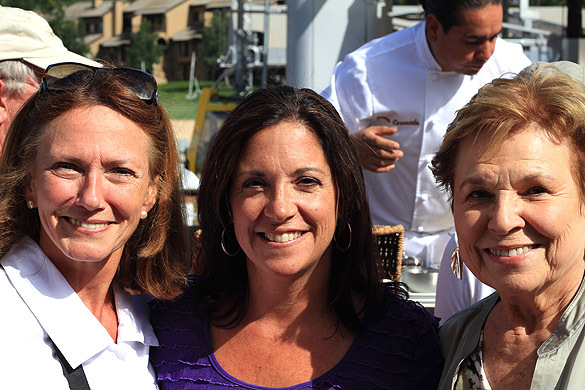 When I was asked by the PR firm that invited me to attend this event in Snowmass which chefs I wanted to interview; I looked carefully at the top three featured chefs. How could I not interview Hosea Rosenberg, winner of Top Chef in 2009 and a Boulder boy through and through? Then there was Alex Seidel of Fruition in Denver, recognized by Food and Wine magazine as one of the Best New Chefs in 2010? He’s a damn rock star…buying a farm and providing veggies not just for his restaurant but others in Denver as well. No, I didn’t seek out Richard Sandoval but his PR person came to me. Would I be willing to do an interview with Richard and his partner in a planned book deal, Diane Henderiks? Sure I thought; why not? Well, that ‘sure why not attitude’ on my part is really a testament to Chef Sandoval’s entire way of thinking. It’s about the food…not fame, fortune or name brand recognition. To tell you the truth…I’ve eaten at his La Sandia Restaurant in Lone Tree, CO adjacent to the Park Meadows Mall. That place where I remember having the BEST Chile Relleno ever and a view of the Front Range that can almost make you think you are in the mountains!. He’s the owner? Really? It seems that Richard is fine with that. He is both the owner and CEO of his restaurant business and his hands on way of doing business is admirable, especially since we are talking about 27 different restaurants from Dubai to the one where we met, Venga Venga in Snowmass, CO. In Denver alone, in addition to La Sandia, he also owns Zengo, a unique fusion of Latin and Asian cuisine and Tamayo in the heart of Denver’s historic Larimer Square. Warm, down to earth and utterly charming…I was hooked on both the man and his food! 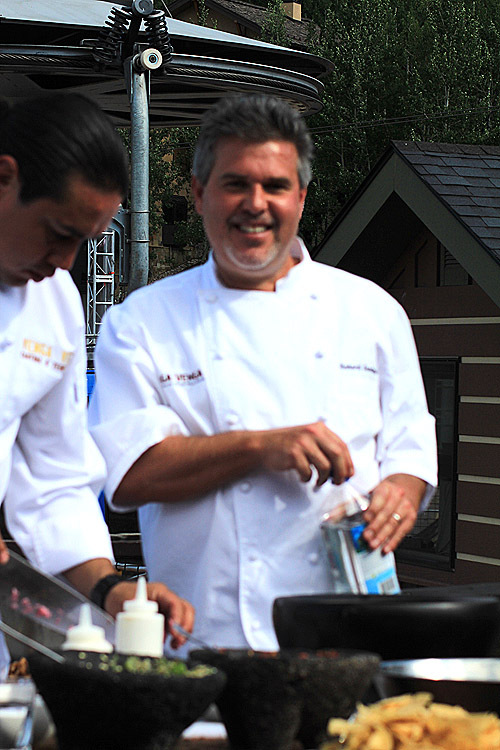 And this will probably not come as a huge surprise to my friends…yes I did setup his Twitter account @Chef_Sandoval and we’ll be talking about a tweetup at La Sandia to happen before the summer is over! I met with both Richard and Diane to get to know them a bit, hear their individual philosophies and their plans for a book to be published and available in the last quarter of 2012. A book that would bring Chef Sandoval’s personal experience and ethics to the project and Diane’s experience with nutrition. Now, if that sounds boring…well, I’ve done as bad a job of stating the obvious as my mind did in putting a spin on Diane before I met her. Seems I had a built in idea of a nutritionist. Wheat grass and all. I was not expecting the firecracker I got to know over this weekend. I told her when I first saw her in the culinary tent directing everyone with her, “Come on people, let’s get this show on the road” attitude that I thought she was a handler for the chefs coming out. These two have known each other since meeting at a culinary event 5 years ago when their booths were adjacent. Their easy relationship is sure to be reflected in their book too. Ever made popcorn in coconut oil. She insists it is To. Die. For. Like me, she has a plastic bottle with a pointed spout (like ketchup and mustard squirters) that she uses to drizzle olive oil into a pan for heating. Unlike me, she uses much less oil! Give your oil time to heat and melt a bit and it will cover the bottom of the pot. Ever used barley when making risotto? Try it…it’s quicker yet still creamy. Pesto is not just for basil anymore. Try using a variety of herbs and nuts to create a pesto. She’s used tarragon and that really struck a nerve. I almost have a tarragon tree in the backyard. She mentioned she uses cashews instead of pine nuts; I’m going to try some toasted walnuts instead. Hmm, walnut/tarragon pesto anyone? Dry roast your grains in the pan before adding any liquids in the recipe. I always do this when I make a dish using pearl couscous that I love…but not so much rice or other grains. Will do ma’am. A simple rule of thumb? The more color on your plate, the more nutrition. And no, I’m not talking Jello shooters. 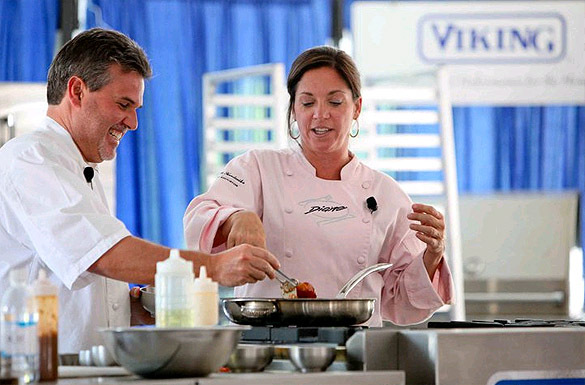 I attended several sessions in the Viking Culinary tent with either Richard or his staff and Diane. 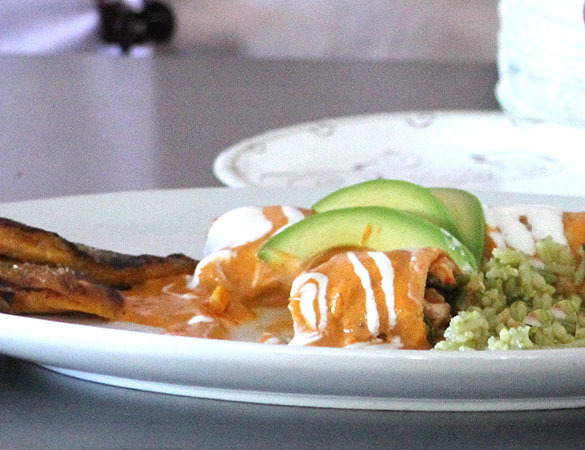 I loved the Shrimp Jalisco dish that Diane and Chef Barry from Richards’ Venga Venga Restaurant made together. Using more peppers and less fat she delivered a most satisfying take on one of Venga Venga’s specialties. I actually ordered the dish for dinner that evening to see if the impact on my palette would be noticeable…and was excited it was not. I want this book now! Until then, we can all be thankful that recipes from her appearances on Good Morning America are available online; visit their website for a library of Diane’s recipes. I couldn’t leave you without one more picture of this beautiful place. Remember a guy named Leonardo Dicaprio and his claim, ‘I’m the King of the World!’ when he was on the bow of the Titanic. He had apparently never been to the top of Snowmass Mountain. It is breathtaking. Grilling romaine for a salad gives it a great smokey flavor. Turn grill to medium high heat. Slice heads of romaine in half lengthwise. Drizzle sliced side with olive oil. Sprinkle with salt and pepper. In a separate bowl mix the olive oil, vinegar, red pepper, herbs, garlic and Parmesan cheese. Place lettuce sliced side down on the grill. Grill for about 3 minutes until lettuce is charred. 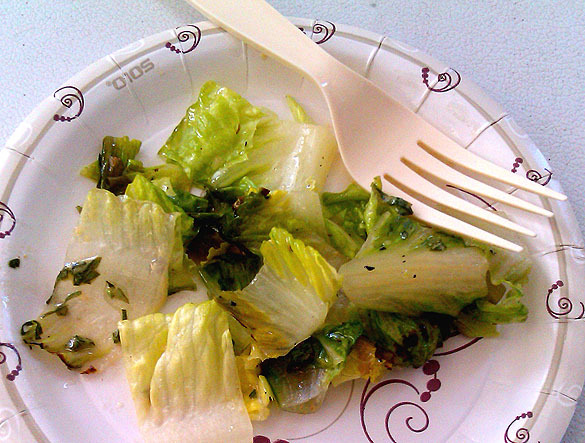 Chop lettuce into large chunks or cut the lettuce head half into spears. Sprinkle with dressing (toss if making the chopped version) and serve warm. So happy to have found your blog as your recipes are fabulous! Thank you so much and glad you found me too…welcome! Wonderful post and grilled romaine! I have only grilled it a couple of times but each time was worth it! Popping corn with coconut oil? Brilliant! I just started using coconut oil and love learning uses for this new (to me) ingredient. Thanks!! Thanks Chris. Funny that I’ve heard of grilled romaine but had just never had it. I served it with the goat pita sandwiches when my friends came over; they just could not believe the difference three minutes on the grill made and are already planning on this being their contribution to their next big family gathering. It is soooo good with so little effort. Perfect dish, right? Coconut oil is now on my grocery list. With a new corn popper I’ve been going a bit popcorn crazy and this does sound good doesn’t it? Another exceptional post Barb! Very informative. Love all the tips, intrigued by the grilled romaine and looking forward to your new pesto recipes I’m hoping you share with us! You take some awesome photographs. The grilled romaine is ‘THE BOMB’ – amazing the great flavor from a mere three minutes of effort. You must do it! I’ve been saving these posts for the when I had a quiet moment to read so that I could truly take it all in!! Your photos reminded me how much I love Colorado – I have added Chef Sandoval’s restaurants to my “restaurants to try” list and will be making a bee line to them the next time we are in Colorado (which will hopefully be sooner than later!!). I loved all of the tips as well – as I will second that if you haven’t made barley risotto you are missing out – it is delicious!! Your tweets about the food had me drooling Barb – good thing there are no calories in tweets otherwise I would be big as a house by now!! As for Richard and Diane, finding them was like finding a hidden treasure! It’s easy and wonderful…you must try it! Mmmmm, this salad does look delicious. The first time I tried grilled romain was in 2007 in NYC when I was competing in a cook-off and one of the other contestants prepared grilled romain dish. I was really surprised at how good it was. At your recommendation I’ll have to give La Sandia another chance. We must have gone on an off day for them as our food there wasn’t very good. I haven’t been for a bit…we should try it together. I remember my friend complaining but then, she complained about everything! I really enjoyed my dish. Let’s do a stealth visit! What a wonderful and fascinating opportunity, Barb! I always find learning more about chefs and their many projects so interesting. It was great to meet them and all of them, to a person, were warm and gracious. That made for a very nice experience for sure. What a great opportunity for you – and what a beautiful location! Just an amazing time…and there might be something in the works for more bloggers next year. 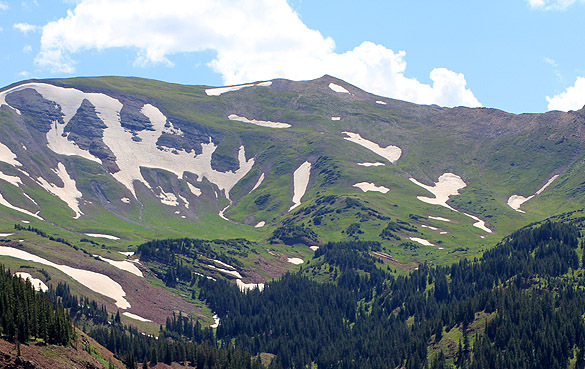 Most beautiful sites I have ever seen in Colorado, bar none. Like you Barb, I was sorely under informed about both Chef Sandoval and Diane. Getting to know them, more about them individually and their professional association/project and their food was an unrivaled highlight for me. Your chairlift photo says it all by the way. On top of the world! I know..and glad I got to share it with you!